This traditional Tibetan mala has 108 beads, plus 3 marker beads (not to be counted in meditation), and a guru bead and silk tassel. This mala has been strung with white color Nylon thread for its strength and durability, especially important when working with natural stones, as their hard edges can sometimes rub against and weaken other threads such as cotton or silk. 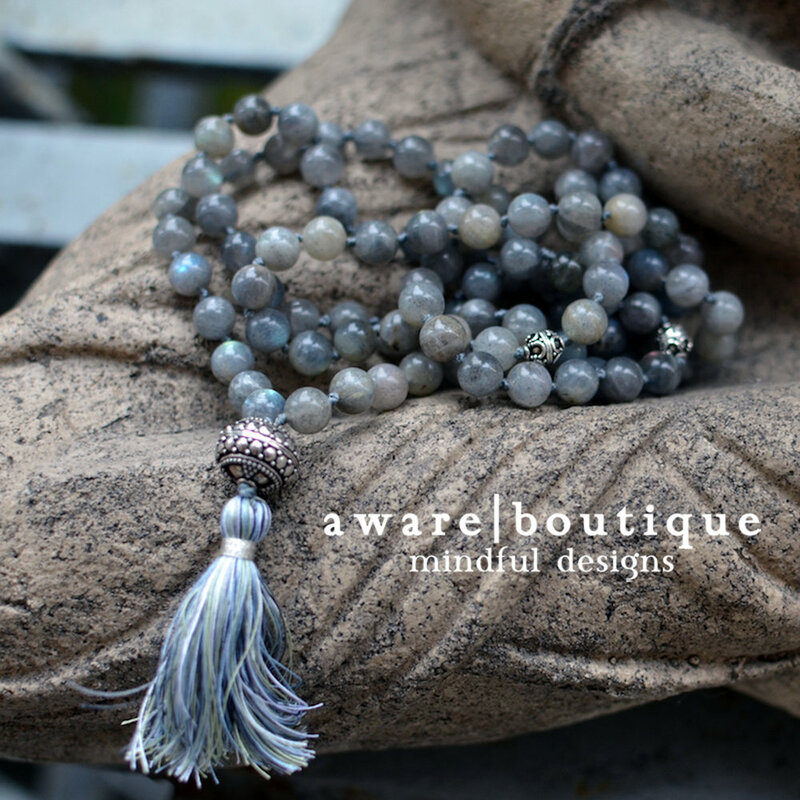 All of our malas are hand-knotted between each bead, which protects your beads should the necklace ever break. It also helps alleviate potential damage caused by beads rubbing against each other. Sea Sediment Jasper, also sometimes referred to as Impression Jasper, or Ocean Jasper, is rare Orbicular Jasper collected from the remote shores of northwestern Madagascar and can only be mined at low tide. It is sometimes referred to as The Atlantis Stone. It caries a gentle nurturing energy that, when used regularly, assists in developing self-love and empathy for others. Known as the "Supreme Nurturer," Jasper is a stone of grounding and stability, providing comfort and security, strength and healing. Historically, Jasper is traceable to all ancient peoples and civilizations. 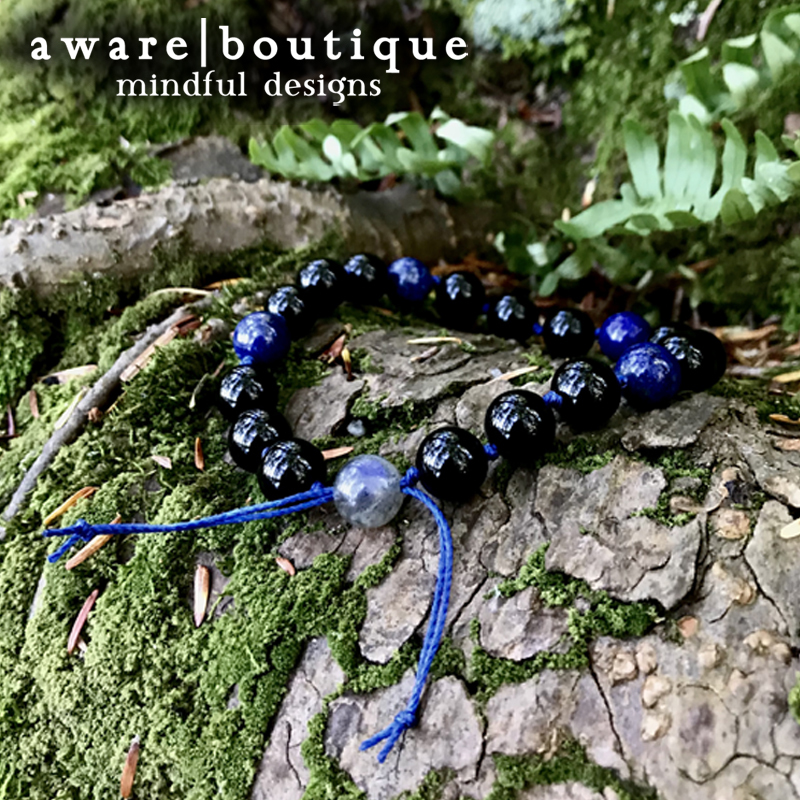 Worn by shamans, priests and kings, it was considered sacred and a powerful protection stone, for both the physical world and in the spiritual realm. Its presence balances the aura to a level of wholeness and peace, and acts as a reminder that one is not here on the physical plane simply for oneself, but to bring joy and substance to others. One of the most ancient stone used by man, the first glass used was natural obsidian, volcanic glass, used to make arrowheads, knives, jewelry, etc. Objects created of manmade glass are reported to have been found from as early as 4,500 BC in Mesopotamia and 3,000 BC in ancient Egypt. Glass is a melding of all four of the traditional elements, because through fire and air the silica earth element is made molten and transmuted into a liquid only to return to its earthly state as a solid. It takes years for the ocean to do its work on a piece of discarded glass. Each coveted smoothed and weathered piece of sea glass was at one time a piece of discarded “junk.” The discarded glass thrown away long ago may have been from a jar or bottle, but sooner or later, its purpose no longer needed, it ends up on the ocean floor. A piece of sea glass is polished smooth on its journey from junk to jewel. This journey for the glass can be harsh at times while the glass is being churned over and over by the pressures of water and sand. Water and sand work on sea glass as pressure and fire worked for the alchemists in the transformation of metals. Similar to how the unconscious works on the personality, the sea works on transforming discarded sea glass into smoothed, rounded, and colorful gems. Each discovered piece of sea glass is entirely unique just like the uniqueness of each personality and their individuation process. Metaphysically, glass represents and carries the energies of transformation, merging of elements, rebirth, focus and communication.